10th lunar month of 1829: born in Edo in the district of Sumiyoshi-chô. 11th lunar month of 1829: he makes his first stage appearance at a very early age, receiving the name of Iwai Hisajirô II at the Nakamuraza. 11th lunar month of 1832: great shûmei for the Iwai clan at the Nakamuraza. Iwai Hanshirô V, Iwai Kumesaburô II and Iwai Hisajirô II respectively take the names of Iwai Tojaku, Iwai Hanshirô VI and Iwai Kumesaburô III. They play together in Segawa Jokô II's drama "Goban Tadanobu Yuki no Kuroshiro" and their stage partners are Matsumoto Kôshirô V, Nakamura Shikan II, Ichikawa Yaozô IV and Sawamura Tosshô I. 1851: Kumesaburô becomes tateonnagata at the Kawarasakiza and he is the stage partner of Ichikawa Danjûrô VIII. 4th lunar month of 1851: premiere at the Nakamuraza of the Tokiwazu-based dance "Kioi Jishi Kabuki no Hanakago", commonly called "Kioi Jishi", starring Ichikawa Kodanji IV, Bandô Takesaburô I, Onoe Kikujirô II and Kumesaburô. 8th lunar month of 1851: premiere at the Nakamuraza of Segawa Jokô III's drama "Higashiyama Sakura Sôshi" (commonly called "Sakura Giminden"); Kumesaburô plays the roles of the shirabyôshi Katsuragi and Ashikaga Mitsuuji [casting]. 7th lunar month of 1852: premiere at the Kawarasakiza of Kawatake Shinshichi II's drama "Jiraiya Gôketsu Monogatari"; Kumesaburô plays the roles of Princess Tagoto, Asazawaya Kishigawa and Princess Teruta [casting]. 3rd lunar month of 1854: Kumesaburô plays at the Nakamuraza the role of the courtesan Yûgiri in the drama "Kuruwa Bunshô". The role of Fujiya Izaemon (Yûgiri's lover) is played by Kataoka Gadô II. 2nd lunar month of 1859: premiere at the Ichimuraza of Kawatake Shinshichi II's drama "Kosode Soga Azami no Ironui" (commonly called "Izayoi Seishin"); Kumesaburô plays the role of Izayoi (Osayo) [casting]. 9th lunar month of 1859: premiere at the Ichimuraza of Kawatake Shinshichi II's Kiyomoto-based dance "Jitsugetsusei Chûya no Oriwake", commonly called "Ryûsei". The leading roles are played by Kawarasaki Gonjûrô I, Ichikawa Kodanji IV and Kumesaburô. 1st lunar month of 1860: premiere at the Ichimuraza of Kawatake Shinshichi II's drama "Sannin Kichisa Kuruwa no Hatsugai", in which Kumesaburô plays the roles of Ojô Kichisa and Hitoe [casting]. 3rd lunar month of 1860: premiere at the Ichimuraza of Kawatake Shinshichi II's drama "Kagamiyama Gonichi no Iwafuji"; Kumesaburô plays the roles of Ohatsu, Onoe II and Oryû [casting]. 7th lunar month of 1860: premiere at the Ichimuraza of Kawatake Shinshichi II's drama "Hachiman Matsuri Yomiya no Nigiwai" (commonly called "Chijimiya Shinsuke"); Kumesaburô plays the role of Miyokichi [casting]. 3rd lunar month of 1862: premiere at the Ichimuraza of Kawatake Shinshichi II's drama "Aoto Zôshi Hana no Nishikie" (commonly called "Shiranami Gonin Otoko"), in which Kumesaburô plays the role of Akaboshi Jûzô [casting]. 2nd lunar month of 1864: Iwai Kumesaburô III takes the name of Iwai Shijaku II at the Nakamuraza. 10th lunar month of 1870: Shijaku plays at the Moritaza the roles of Otane and Nureginu in the drama "Yosetemitsu Renjô Kidan", whose plot and characters are similar to the classic "Honchô Nijûshikô". 11th lunar month of 1870: Shijaku plays at the Moritaza the role of the courtesan Yûgiri in the drama "Kuruwa Bunshô" (performed under the title "Koremo Katamimaru Izaemon"). The role of Fujiya Izaemon (Yûgiri's lover) is played by Sawamura Tosshô II. 2nd lunar month of 1872: great shûmei for the Iwai clan at the Moritaza. Iwai Shijaku II and Iwai Hisajirô III respectively take the names of Iwai Hanshirô VIII and Iwai Kumesaburô IV (his adopted son Arashi Eizaburô takes the name of Iwai Shijaku III at the Nakamuraza). Hanshirô plays the roles of Isonami and Omatsu in the drama "Kaikeizan Sakiwake Genji". Hanshirô plays also the roles of Yoshitsune and the courtesan Agemaki in the dramas "Kanjinchô" and "Sukeroku Yukari no Yaezakura". In the first play the roles of Benkei and Togashi are played by Kawarasaki Sanshô and Ichikawa Sadanji I. In the second play, the roles of Sukeroku and Ikyû are played by Kawarasaki Sanshô and Nakamura Nakazô III. This program is very successful and performed up to the 23rd day of the 4th lunar month. 5th lunar month of 1872: Hanshirô plays at the Moritaza the role of Okaru in the classic "Kanadehon Chûshingura". 9th ~ 10th lunar months of 1872: the Moritaza is relocated in the district of Shintomi-chô. Hanshirô takes part in the opening program in October, which is made up of the drama "Sangoku Musô Hisago no Gunsen". He also plays the role of Kinshôjo in Chikamatsu Monzaemon's masterpiece "Kokusen'ya Gassen". 10th lunar month of 1872: premiere at the Moritaza of Kawatake Shinshichi II's zangirimono "Tsuki no En Masu no Igaguri"; Hanshirô plays the role of Otomi [casting]. March 1873: Hanshirô plays at the Nakamuraza the role of Osan in the shinjûmono "Hanabiraki Kasa no Rokuro". His stage partner in the role of Osan's lover Mohei is Onoe Kikugorô V.
June 1873: premiere at the Nakamuraza of Kawatake Shinshichi II's drama "Tsuyu Kosode Mukashi Hachijô", commonly called "Kamiyui Shinza", in which Hanshirô plays the role of Okuma [casting]. October 1873: his adopted son Iwai Shijaku III dies. 1874: Hanshirô becomes zagashira at the Nakamuraza. June 1874: Hanshirô plays at the Nakamuraza the role of the courtesan Umegawa in Segawa Jôkô III's shinjûmono "Koi no Tayori Misao no Kanabumi". His stage partner in the role of Umegawa's lover Kameya Chûbê is Nakamura Sôjûrô. October 1874: Hanshirô plays at the Nakamuraza the role of the courtesan Koman in the drama "Gochûmon Satsuma Jôfu" (similar to Namiki Gohei I's drama "Godairiki Koi no Fûjime"). The roles of Sangobê and Gengobê are played by Nakamura Shikan IV and Nakamura Sôjûrô. March 1875: Hanshirô plays at the Nakamuraza the role of Shizuka Gozen in the classic "Yoshitsune Senbon Zakura". October 1875: premiere at the Nakamuraza and the Shinboriza of Takeshiba Kinsaku I's drama "Minori no Aki Seishô Denki"; Hanshirô plays the role of Uji-no-Kata [more details]. 1877: Hanshirô tours in Nagoya with Ichikawa Danjûrô IX. October 1878: premiere at the Shintomiza of Kawatake Shinshichi II's drama "Jitsugetsusei Kyôwa Seidan"; Hanshirô plays the roles of Rokubê's daughter Okoro, Aoi Gozen and Kihachi's nyôbô Omaki [casting]. January 1879: Hanshirô plays at the Shintomiza the roles of Konami and Oishi in the classic "Kanadehon Chûshingura". He also plays the roles of Ono no Komachi, the courtesan Sumizome, the spirit of Komachi's cherry tree and Yoshimine Munesada (role rotation everyday) in the drama "Tsumoru Koi Yuki no seki no To". February 1879: premiere at the Shintomiza of Kawatake Shinshichi II's drama "Ningen Banji Kane no Yo no Naka"; Hanshirô played the role of Oran's niece Okura [casting]. 16 July 1879: Hanshirô takes part in the gala night at the Shintomiza in the honor of the General Ulysses S. Grant [more details]. 23 May 1880: premiere at the Saruwakaza of Kawatake Shinshichi II's drama "Arimatsuzome Sumô Yukata"; Hanshirô plays the roles of Omichi's daughter Omaki and Takao's spouse Owaka [more details]. January 1881: Hanshirô plays at the Shintomiza the roles of Shizuka Gozen, Kosen and Osato ("Sushiya") in the classic "Yoshitsune Senbon Zakura". March 1881: premiere at the Shintomiza of Kawatake Mokuami's masterpiece "Kumo ni Magou Ueno no Hatsuhana"; Hanshirô plays the roles of Namiji and Michitose [casting]. June 1881: premiere at the Shintomiza of Kawatake Shinshichi II's jidaimono "Youchi Soga Kariba no Akebono" [casting]; Hanshirô plays the role of Kisegawa no Kametsuru. 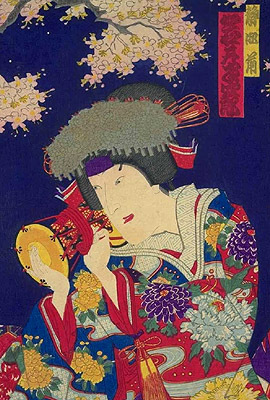 July 1881: Hanshirô plays at the Shintomiza the role of Fukushimaya Osono in the drama "Kodaigata Shinzome Yukata" [print]. November 1881: premiere at the Shintomiza of Kawatake Mokuami's zangirimono drama "Shima Chidori Tsuki no Shiranami"; Hanshirô plays the role of Oteru [casting]. January 1882: Hanshirô appears on stage for the last time, at the Harukiza. He falls seriously ill and dies the 19th of February. His tombstone is located in the precinct of the Jôshinji Temple in the district of Fukagawa. Iwai Hanshirô VIII, who was both tall and good-looking, was an excellent onnagata, especially in the sewamono roles, and considered as the worthy heir of his grand-father Iwai Tojaku. He costarred the best tachiyaku from the last years of the Edo period to the first years of Meiji: Ichikawa Danjûrô VIII, Kataoka Nizaemon VIII, Bandô Hikosaburô V, Ichikawa Kodanji IV, Nakamura Shikan IV, Onoe Kikugorô V and Ichikawa Danjûrô IX. He was one of the last true Edo onnagata.